Riviera at Bonita Bay in Bonita Springs, Florida. Riviera at Bonita Bay is located near the north gate of Bonita Bay just off of Country Club Drive. Riviera at Bonita Bay consists of only one cul-de-sac street, Riviera Lakes Court. The street is hand laid, herring bone, brick paver. There are a total of thirty five single family villa homes in Riviera. Every home in Riviera has it’s own private swimming pool. From the lanais of the homes, owners enjoy golf course views or a preserve buffer area views. Homes in Riviera were built between 1990-1995 build dates. Square footages range from 1,980 to about 2,998 of living area. Riviera is currently built out and there is only resale real estate available. Riviera is located across the street from a master planned, paved walking path which circles a lake and connects to the Bonita Bay walking path system. Home owners in Riviera also enjoy the opportunity to use the common amenities and purchase equities in a number of Bonita Bay advanced amenities programs which include, tennis center, fitness club, golf – five private courses and marina. Bonita Bay also offers private access to four private parks included a beach park on the shores of Bonita Beach. A community shuttle bus is available for transportation to and from Riviera Lakes to the Bonita Bay beach park. 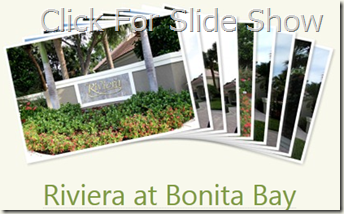 Subdivisions in Bonita Bay similar to Rivera at Bonita Bay include Siena at Bonita Bay and Montara at Bonita Bay.